Unmanned equipment and technology systems are expanding into nearly all walks of our lives. We are developing new systems that can expand our reach and capabilities using remote controlled equipment. By Rory Jackson and Bob Stanton, Omnetics Connector Corporation. However, we are also adding to the challenges and demands upon the electronics that serve and drive them. Connectors and cable systems have been changing rapidly to meet those needs. Conveniently, that exact technology has helped speed up the design and manufacturing of new cable and connectors for application specific unmanned equipment. Remote devices now serve us, spanning from simple ground based robotics to drones mounted with cameras and onto rovers on mars. Each new system appears to start by using COTs and standard connectors on their prototype modules. As the design evolves and enters into the systemisation phase, new design needs arise. Emphasis changes include size reduction, shape fitting and/or mounting requirements. Extremely rugged connectors may need to carry enough current to control heavy machinery used in dangerous conditions. Equipment like this will protect and save lives across the spectrum from Military to Civil Service agencies. Circular connectors that had been used in ruggedised equipment and machinery have begun to evolve in many ways to serve these industries. To meet today’s demand for small diameter connectors, many manufacturers are scaling down older designs to add to their existing lines. The popular Mil-DTL-38999 Circular connector uses 18-20 size pins to carry up to 12A on 20 AWG wiring. A smaller 38999 connector is being standardised by a number of companies working with the DLA for a down-sized Mil. Spec. version that will be a smaller size, more universally available circular connector with a triple-start thread coupling system. It will also mate quickly and have EMI shielding. This new standard will likely use size 23 pins and handle about 10A on 20-22 AWG wire. Many companies already offer a smaller Micro-Circular connector line with size 24-pin/sockets that support 3A on 24-30 AWG wire. Some of the smallest circular connectors offer the use of size 30-pins, support 1A and 30-32 AWG wiring. In this size, note that pin to pin spacing drops from over 75 mils pitch, down to 25 mils. This reduces the diameter of both the connector and the cable involved. Cable flexibility improves simultaneously. Many new circuits respond well to lower voltages and current flow and allow the connectors to be more compact. The newer and smaller ratcheting connectors mate-up easily and lock quickly while offering additional features such as being water-proof and using less panel mounting space on the instruments. Special ground wires, as well as use of braided cable shielding, is often used to protect the cable from both electrical and physical damage. Shielding is often bonded over the metal ratcheting style connectors being used today. Unmanned equipment designs are evolving rapidly, and in many cases, the need for easy disconnection and reinstallation of electronic modules is necessary. Image storage or Ethernet modules are often installed in hand-launched UAVs during ISR (intelligence, surveillance and reconnaissance) missions. With fast-latching connectors they are exchanged on the ground with fresh modules. The smaller and lighter weight connectors allow longer flight times and can offer more maneuvering capability in hand launched aerial systems. Many ISR circuits are using solid state chips that run at digital Gigabit speeds. High speed surveillance and image displays demand high signal integrity of the connectors as well. UAV video capture rates are climbing as we install devices that send 20 megapixel images at 60 frames per second and are compressed into transmission or storage onboard. This totals to over 7 gigabits/sec transmission of digital data. Unmanned connector systems must focus on rugged performance to survive the rigors of their applications. Connector mating elements and housings are often critical. Connectors frequently use nickel plated 6061-T6 aluminum or hardened polymer shells containing the pin to socket elements inside. BeCu (beryllium copper) flex pins are made to ASTM B194 and tempered to over 17,200 ksi and then plated with nickel/gold. Low resistance is critical while retaining contact during shock and vibration of the oft-moving equipment. Wires most often use strengthened copper coated with Teflon insulation. Connectors are pretested for high reliability and long range performance. Fortunately, the demand for lighter weight and smaller cable and connectors match up well with the change in circuit voltages and currents. More ruggedised micro and nano sized rectangular connectors are being used in UAVs as modern designs are being completed. The push for SWaP (Smaller, Light Weight and Power) has been answered two ways. First, designers can begin with ruggedised military-quality micro and nano-d connectors with an eye to tailor their designs on the fly. Second, solid models can be quickly adjusted and sent to automated machining equipment to build them to fit the new application exactly. 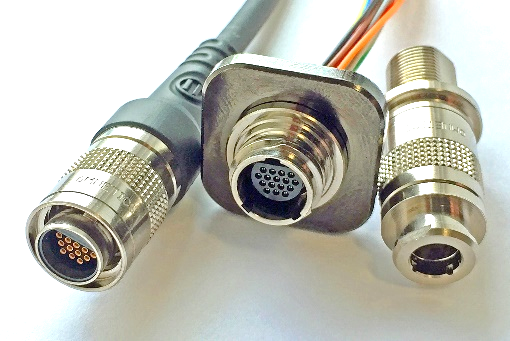 Beyond customising standard designs, connector designers now supply a wide range of mixed signal hybrid connectors. Often size and weight are significantly reduced by using only one cable and connector carrying both power and signal in the same system. These new hybrid connectors are also adjusted to meet the application that is specifically needed. The new connector designations are still evolving but seem to be settling at SWaP-R or SWaP-C. (The initials cover speed, light-weight power and either Cost or Reliability, whatever is most critical). Given the challenges at stake, design engineers involved with unmanned systems are increasingly turning to companies like Omnetics Connector Corporation to select best-in-class connectors. The company has over 25 years of experience in design and manufacturing, with a strong focus on Micro-miniature and Nano-miniature highly reliable electronic connectors and interconnection systems.